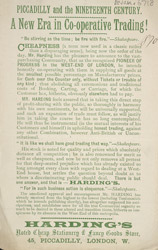 This leaflet is advertising Harding’s cheap stationery and fancy goods store. In the 19th century there was an increased demand for paper of all kinds and especially for fine writing paper. The penny post, introduced in 1840 created a cheap and reliable method for corresponding with friends and family around the country. Writing paper was usually sold in wads, in blue or cream with matching envelopes. Paper edged with a black border could be purchased for periods of mourning. Fine writing paper could be expensive but this stationer is selling good quality stationery at cheap prices and is dealing in cash only.